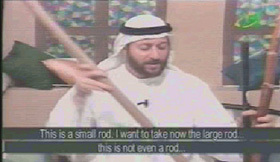  Al-Jazeera (Qatar), October 5, 1977. http://www.aljazeera.net/programs/shareea/articles/2003/5/5-28-6.htm. Islam Online, http://www.islamonline.net/fatwa/english/FatwaDisplay.asp?hFatwaID=41775, June 25, 2003/July 25, 2003. 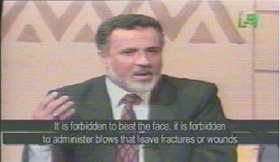 IQRAA Television (Saudi Arabia), Program on Imposing Discipline in the Family: Hosted by Jasem Muhammad Al-Mutawah, Expert on Family Matters, May 9, 2002, http://stream.realimpact.net/rihurl.ram?file=realimpact/memri/memri_10-30-02_08.rm.